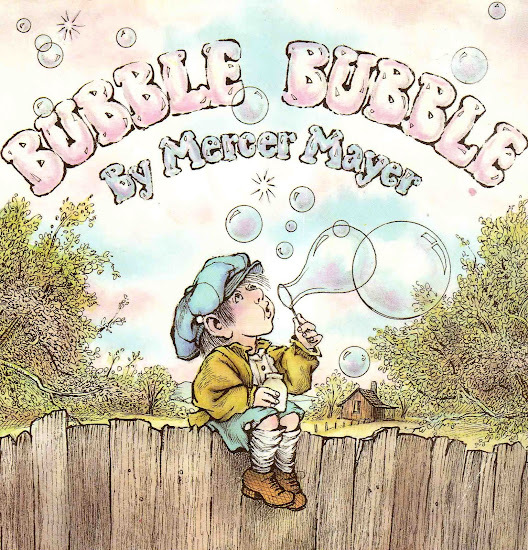 By now you should all know I am a huge vintage Mercer Mayer fan, so anytime I stumble across one I haven't seen since 1976, it totally blows my mind. I was at my local used book shop this week, flipping through the paperbacks like I always do, and I came across this $2 treasure... but seriously, I would have paid $50 for the memories it instantly evoked within me. Me, sitting Indian-style (or criss-cross applesauce as they call it in these evolved times) in the library... I remember loving Mercer's often frugality of words. His trust in letting the pictures tell the story so thoroughly. His sense of spooky, just titillating enough to give goosebumps but not scary enough to make you put it down. The wonderful nostalgia his characters create with their innocent hearts and period dress. And here, the bubbles, oh the wonderful bubbles! One day as I was walking, I bumped into a bubble. It wasn't just one bubble, but lots of bubbles. 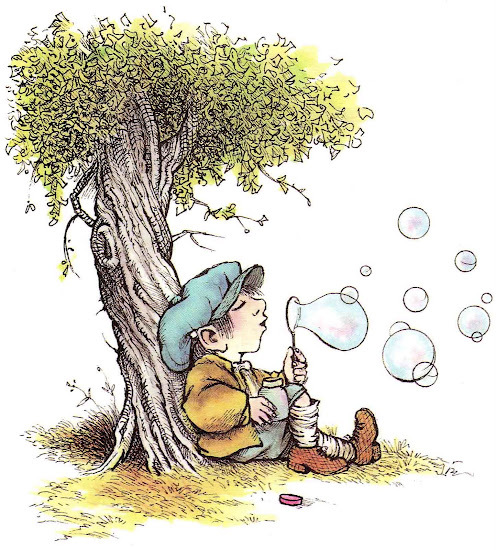 And they weren't just any kind of bubbles, they were magic bubbles. So I bought a magic bubble maker and said good-bye. I started blowing bubbles, magic bubbles, everywhere. Then suddenly, something strange happened! Something strange indeed! In a flash, a long bubble turns into a fanged reptile... that is then chased away by a fierce feline... that is then scared by a giant elephant... frightened away by a tiny mouse. 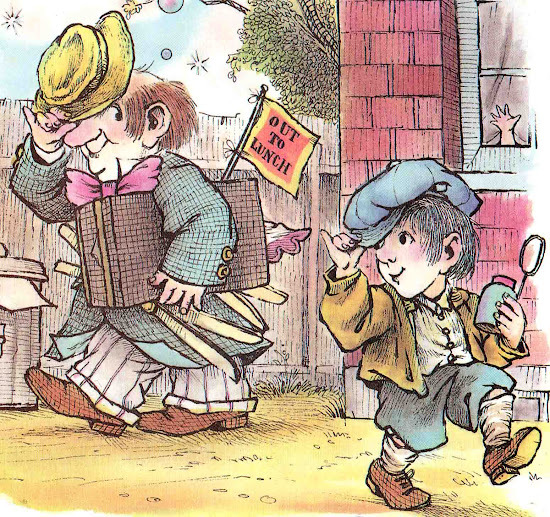 After the boy has had enough of this crazy magic, he pours the bubble juice onto the ground and walks off. 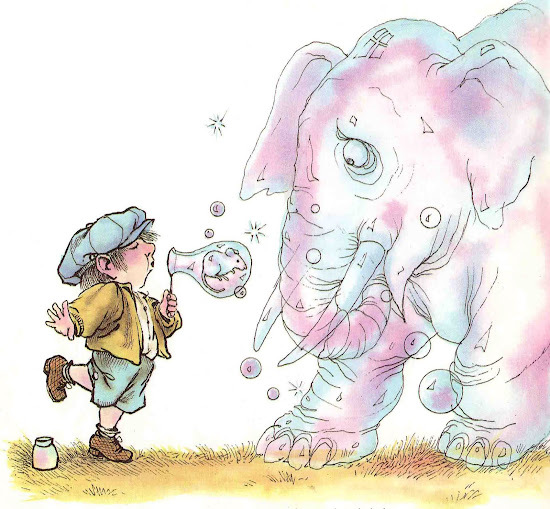 Anyway, everyone knows there's no such thing as magic bubbles. Well, tell that to the creature rising from the bubble pool. Pure magic. Mercer's stuff just kills me with delight, and this one in particular holds such fond memories of childhood for me. Wonderful drawings, great story. Seeing it again there on the shelf took my breath away. We read Bubble Trouble by Margaret Mahy which is a lot of fun, but I shall now be on the look out for this book. Thanks for the tip! good one. i'll have to keep an eye out for it. Thanks! Great stuff. With 100s of his books on my bookshelves, I belong in Mercer Mayer Anon. His 70s stuff is AMAZING. I am always running across works I missed when making the Mercer Mayer Bibliography on Wikipedia. Thanks to family members that know my obsession, I recently discovered some of his early 1970s magazine work... that I am reluctant to add or mention on Wikipedia.... but it is great one page drawings that have his One Monster After Another feel. My favorite Mercer Mayer find so far was a first edition of "The Queen Always Wanted to Dance" for $2. 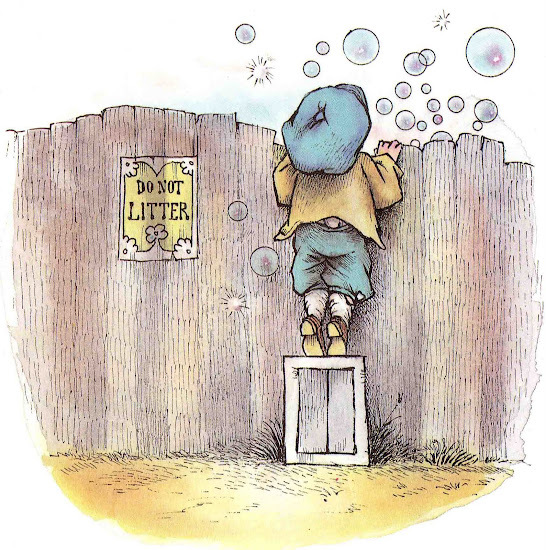 Another favorite was written by Jan Wahl, but illustrated by Mercer Mayer: Grandmother Told Me. I love your blog. Thank you. I picked up an old library copy of "Hiccup" by Mercer Mayer at our library sales room. It was in the free box and some memory (from your blog) told me to grab it. My son loves it. Thank you for helping grow a love of books. ahh thank you for this - while I don't recall ever reading Bubble Bubble...I had totally forgotten about two of my favorites: Liza Lou and the Yeller Belly Swamp, and One Monster After Another. What incredible books, and now I'll definitely have to track down Bubble Bubble! Funny -- I scored an old copy of this book over the summer and wondered if you had already reviewed it. Loved your review, as usual. I love Mercer Mayer. I swear I have every book. Thanks for reminding me. Now I'll go take a look at them all again and enjoy them! I think the original printings of this WERE wordless (I don't have a 70's printing though to make sure).